In a pewter gray hue, these elegant bell lamp shade feature trim along the top, bottom and ribbing. Give any table lamp a new look with these stylish bell lamp shades. From the Springcrest Collection™, the softback shades feature a soft pewter gray color throughout as well as the top, bottom and ribs. Each has a white lining and polished brass spider fitter. The correct size harps are included. Set of 2 lamps. Each is 7" across the top x 12" across the bottom x 9" on the slant x 8 1/2" high overall. Pewter gray color fabric. From the Springcrest Collection™. Softback bell lamp shade. White lining. Polyester fabric for outside and lining. Self trim on top, bottom and ribs. Color and hopefully the proper size??? I think they will match my decor well. Matched my decor and buffet lamps. I have lamp that needs shade that has circle that fits over bulb? BEST ANSWER: Our product specialists would be happy to help you with your needs. They can be reached via chat or phone (877-704-2425). 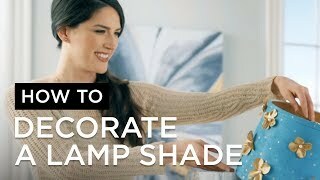 When lamp is lit, does color look grayish or brownish? 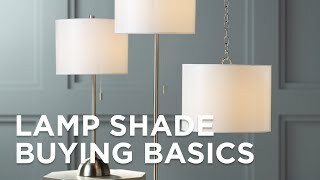 BEST ANSWER: Hi - It will look light gray, but it can also depend on the color temperature of the bulb you are using (2700K Warm, 5000K Daylight). Accent your kitchen with the farmhouse appeal of this set of 4 French Rooster giclee printed lamp shades with clip-on attachment. Brilliant red coral and a mighty nautilus breathe life into this set of 4 giclee print lamp shades with clip-on style fittings in polished brass. Creating a French country elegancethis set of 4 Parisian Blue giclee lamp shades feature a botanical motif with rope-like borders. Accent an entertainment space or lounge with the bolddice-like black on white polka dot pattern on this set of 4 giclee clip-on lamp shades.